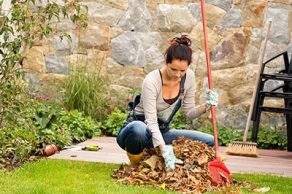 Yardwork Safety | Massachusetts Chiropractic Society, Inc.
Before you rev up the lawnmower or reach for your rake this fall, the American Chiropractic Association (ACA) cautions you to consider the possible consequences: upper or lower back strain, neck strain and pain in the shoulders. When it’s still warm outside, avoid the heat. If you’re a morning person, get the work done before 10 a.m. Otherwise, do your chores after 6 p.m. When raking, use a “scissors” stance: right foot forward and left foot back for a few minutes, then reverse, putting your left foot forward and right foot back. The equipment available today for lawn and leaf management can turn the average homeowner into a lawn specialist overnight. But the use of weed trimmers, leaf blowers and hedge clippers also has sent many aspiring landscapers to the office of their local doctor of chiropractic. Regardless of what piece of equipment you use, make sure it has a strap and that you use it. Place the strap over your head on the shoulder opposite the side of your body from the device. This will help normalize your center of gravity. Be sure to switch the side on which you operate the equipment as often as possible, and to balance the muscles being used, alternate your stance and motion frequently. Try ergonomic tools. They’re engineered to protect you when used properly. When mowing, use your whole body weight to push the mower, rather than just your arms and back. If your mower has a pull cord, don’t twist at the waist or yank the cord. Instead, bend at the knees and pull in one smooth motion. Take frequent breaks from the activity of the day. Muscle fatigue may be felt when using any of these devices for an extended period of time. If your equipment is loud, wear hearing protection. Stand up and prop your heel on a back door step or stool with your knee slightly bent. Bend forward until you feel a slight pull at the back of the thigh, called the hamstring. You may need to stabilize yourself by holding on to a garage door handle or sturdy tree branch. Hold the position for 20 seconds, then relax. Do it once more, and then repeat with the other leg. Stand up and put your right hand against a wall or other stable surface. Bend your left knee and grab your ankle with your left hand. Pull your heel toward your buttocks to stretch your quadriceps muscles at the front of your thigh. Hold that position for 20 seconds, relax and do it again. Repeat with the other leg. Weave your fingers together above your head with your palms up. Lean to one side for 10 seconds to stretch the side of your upper body, then reverse. Repeat two or three times. “Hug your best friend”- Wrap your arms around yourself after letting your breath out and rotate to one side as far as you can go. Hold for 10 seconds; then reverse. Repeat two or three times. If you experience pain or discomfort following yard work, contact a doctor of chiropractic. Chiropractors are trained and licensed to treat the musculoskeletal system and can also help you lead a healthier life by focusing on wellness and prevention. Search Find a Doctor to find a chiropractor in your area.